My husband and I motored through the old city in a small boat, transported to the past, to Old Europe. The air was still. Cars and voices could be heard, but only as subtle background noise. Bicycles were everywhere. I was seeing in front of me how I pictured Europe to be in the 1700s—old stone archway bridges, brick buildings, brick roads. 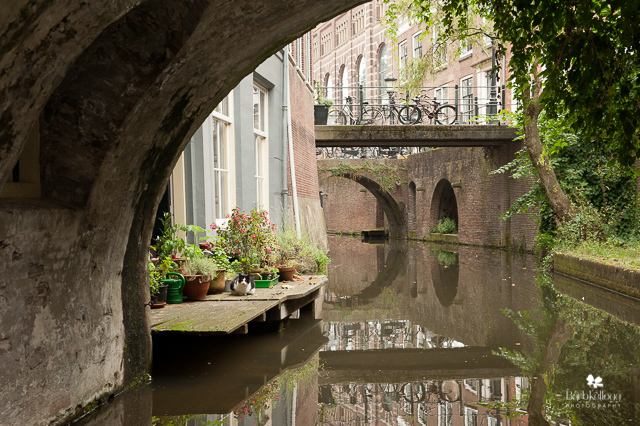 The boat hummed along through the canal in Utrecht, Holland. The captain apologized for the overcast morning, but I loved that it was a softly lit morning as there were no harsh shadows. We almost had the canal to ourselves. I was taking in the scenery, but also capturing bits and pieces with my camera. It was one of those "right place right time" moments as we approached the bridge's archway, a view that was very nice on its own. I almost missed the cat. He (she?) was sitting so still, staring at us. Sweet serendipity was on my side. I did notice the cat! And this wonderful image was the result. The first image is with just minor adjustments made during post-processing. Similar to what a straight out of camera jpg would look like. While this accurately captures the scene, it doesn't have any oomph. The scene looks flat, not to mention the bits of garbage and a few leaves in the canal. 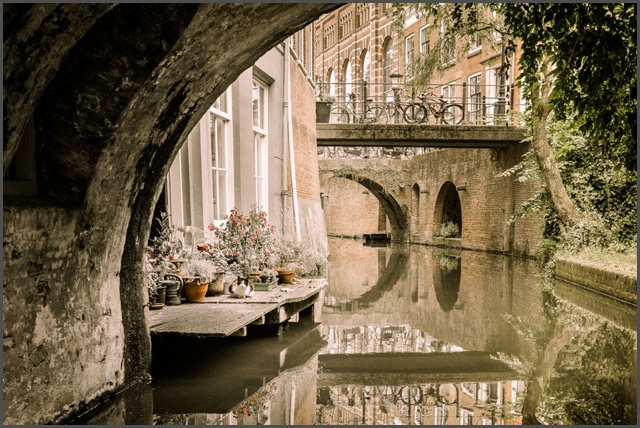 The photograph that I titled Dutch Cat has been very popular for me. I think that Old World look of Europe attracts people, as it's quite different looking that the architecture here in the United States. Of course having a cat in the photo doesn't hurt either! The editing wasn't all that drastic. I knew I wanted a warmer look to the photograph. Remember it was an overcast day, so it did seem kind of grey out if I were to give that day a color. Also, because I didn't have a lot of strong shadows, I actually wanted to darken my shadows a bit to give more contrast to the image, to make it look less flat. I also felt the cat was lost on the little deck with the colorful planters filled with flowers and greenery. To me the image was about bringing out the texture in the architecture and de-emphasizing the color in the scene. Kind of like how an old photograph fades over time. The reflections in the water were also important to me. What was NOT important was the garbage in the canal. Cloning out the garbage only served to improve the scene. In a small image online it doesn't look bad. But have this hanging on your wall as a 24x36" canvas, and suddenly you have garbage hanging on your wall. YUCK! I'm really happy with the decisions I made with this photograph. I made a lot of intentional choices with how I wanted the scene to look, and how I wanted to feel when I looked at it. Dutch Cat is available for purchase online and at art fairs. If you have any questions about this image, please feel free to comment or to send me an email.